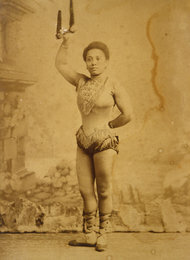 Long before Cirque du Soleil began selling $180 seats to eight shows in Las Vegas or Floating Kabarette came to Brooklyn, high society and avant-garde crowds were flocking to extravagant theaters on Montmartre in Paris to see the finest aerialists from Europe. The Morgan Library’s exquisite micro-show, Degas, Miss La La, and the Cirque Fernando, documents the meticulous work of Mr. Degas to portray the magic, daring, and wonder inside a 2,000-seat arena where he experienced the artistry of one of the must-see acts of 1879 – a mixed-race German aerialist who hung from a trapeze clenching an apparatus in her teeth from which she dangled a firing cannon. As in the Met’s blockbuster show, Impressionism, Fashion, and Modernity (which also features a circus-themed painting in its last gallery), the Morgan makes the case that Degas selected this subject because was associated with the height of fashion (along with café concerts and racetracks). 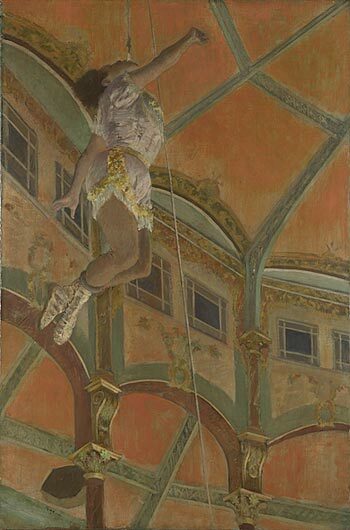 Although this particular work was the only circus image Degas would ever paint, just tackling the dazzle and glamour of Miss La La dangling 70 feet in the air (before the cannon stunt) showed that he was capturing what was “happening” among high society and artsy types in their “modern” life. If you love Impressionism and theatricality, get over to the Morgan to enjoy the mechanics behind the creative process and flip through the digital version of our artist’s sketchbook (which was to fragile to be sent from France) right inside the colorful upstairs gallery. 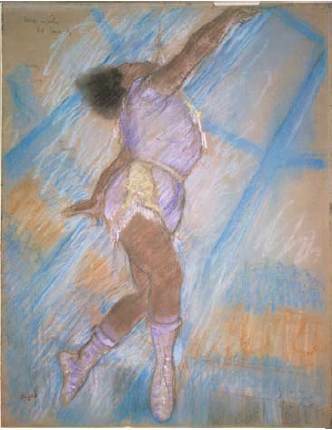 This entry was posted in Art, History, Museums, Theater and tagged art, drawing, history, museums, painting, style, theater by mssusanb. Bookmark the permalink.